Thank you for your continued support – Any input is most welcomed. 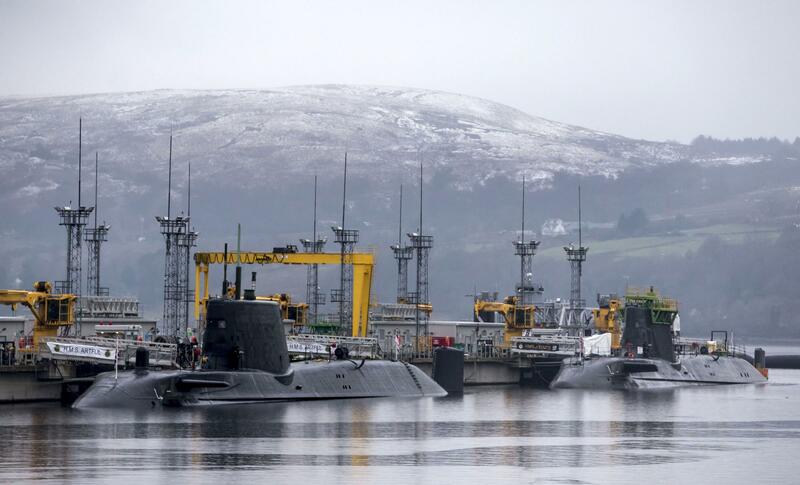 Astute-class submarines HMS Artful (left) and HMS Astute (right), at HM Naval Base Clyde, also known as Faslane. The Royal Navy’s new nuclear-powered submarines have been plagued by 69 safety incidents and “near misses” over the last four years. The Astute class of submarines based at Faslane on the Clyde has seen reported reactor incidents at sea or on shore almost double from 12 in 2014 to 21 in 2015. Though the MoD insists that the incidents are all minor, critics warn that they undermine the boats’ reliability and safety. The first submarine of the class, HMS Astute, has already been out on operations, and the second, HMS Ambush, was launched in 2011. The third, HMS Artful, was formally handed over to the Royal Navy in December 2015. The four remaining Astute submarines are either still being built by the defence firm BAE Systems at its Barrow shipyard, or are due to be built there. The construction programme has been subject to a series of delays and cost overruns. The Ministry of Defence revealed the number of safety events recorded with Astute submarine reactors between January 2012 and January 2016 in response to a request under freedom of information law. There were an average of more than 17 a year, or one every three weeks. According to the independent nuclear engineer John Large, the submarines were suffering serious problems. “This continuing experience of the Astute class reactor problems not only imperils the boats when at sea but is likely to result in cutbacks to the number of patrols, voyage durations and the extent of roaming of the high seas,” he said. John Ainslie, coordinator of the Scottish Campaign for Nuclear Disarmament, pointed out that Astute submarines had been involved in a series of mishaps, including running aground on the Isle of Skye. “It is only a matter of time before one of these incidents results in a serious nuclear accident,” he said. This entry was posted in UK Submarines, Uncategorized and tagged Falane, HMS Artful, HMS Astute, nuclear submarine, Reactor incident, Submarine on February 22, 2016 by jasonlockley. A replacement for Britain’s ageing Vanguard-class nuclear missile submarines has come a step closer after the Ministry of Defence awarded £201m to BAE Systems to develop the so-called “Successor” vessels. The funding will allow the FTSE 100-listed arms business to develop the design of the new submarines, including the layout and systems, and build early prototypes. The move comes despite the massive project having yet to get formal approval in Parliament. The project to upgrade Britain’s nuclear submarine deterrant is estimated to cost £31bn, with a £10bn contingency fund to pay for any unexpected costs. Last week, MPs on the Defence Select Committee wrote to Defence Secretary Michael Fallon saying that there was an “unacceptable level of uncertainty” on the Successor programme among “not only Parliament, but also main contractors and their supply chains”. Committee chairman Julian Lewis said there was “growing concern” no date had been set for a Parliamentary vote on whether or not to go ahead with the programme, adding that MPs on the committee would “be grateful for an indication of when this long-anticipated vote is due to be held and an explanation of any reasons for not proceeding forthwith, now that the political obstacles which existed in the previous parliament no longer apply”. If it does go ahead, the Successor submarine project will be one of the biggest the military has undertaken in decades. It will also see the creation of some of the most technologically advanced and stealthiest submarines in the world. BAE will be the lead contractor on the project and expects to have between 5,000 and 6,000 people working on the programme at its peak, out of a total of about 9,000 people in the unit at the time. BAE’s submarine business currently employs 7,700 staff, with the bulk of them working on the Astute-class attack submarines. Other major companies involved include Rolls-Royce, which will build the nuclear reactors on the submarines, and Babcock. Hundreds of other smaller companies will also be in the supply chain for the programme. More than £1bn has already been spent on design work, as well asexpanding BAE’s shipyard in Barrow in Furness, Cumbria, where the submarines will be constructed. The round the clock nuclear deterrent is as crucial to Britain’s national security now as it has ever been. We use it everyday to deter extreme threats that cannot be countered by any other means. However, Mr Fallon has previously warned that the industry will put national security at risk if the project suffers delays or goes over budget. Tony Johns, managing director of BAE’s submarines division, said: “We are incredibly proud of the role we play in designing and building our nation’s submarines. “The Successor programme is one of the most challenging engineering projects in the world today and this additional funding will enable us to further mature the design”. This entry was posted in Uncategorized on February 9, 2016 by jasonlockley.